DCLIB Bargraph Current Loop Level Indicator - Deeter Electronics Ltd. DCLIB Bargraph Current Loop Level Indicator - Deeter Electronics Ltd. 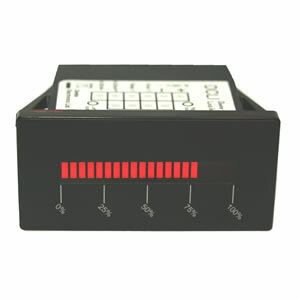 The DCLIB (Deeter Current-Loop Indicator – Bargraph) is an easy-to-mount display module designed to work with any 4-20mA or 0-20mA process sensor. The display consists of a 20-segment bar LED that can indicate the loop current with a 5% resolution*. There are two modes of operation, “Scrolling” and “Rolling”. In Scrolling mode, the number of bars changes to indicate the loop current. This mode would typically be used to indicate liquid levels. In Rolling mode only one LED segment is on at a time and this mode would typically be used with a position sensor. The module incorporates two relays which can be individually configured to operate at any 5% display threshold. Separate ON and OFF settings allow the amount of hysteresis to be chosen, and also allows the user to decide whether a relay is open at low current/closed at a higher current or operates the other way round – open at high current/closed at a lower current#. For switching high-voltage or high-current loads, the on-board relays can drive external slave relays – such as the Dual Level Controller. * Calibration assumes a linear relationship between loop current and display. # Relays have normally-open contacts and will be open when there is no power.